Basketball games do not just rely on the skill levels of the players, but also on the coach. 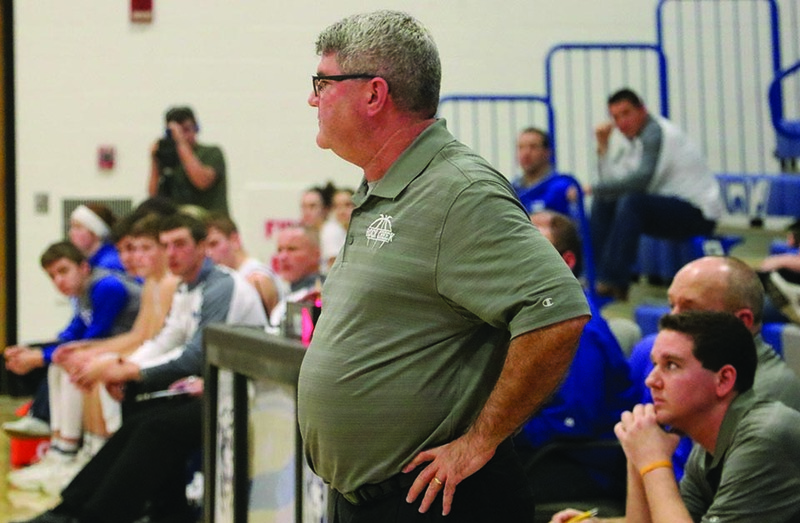 At Rock Creek, boys basketball head coach Jim Johnston has accomplished his 300th career win during this season. When Johnston accomplished the 300th career win, his team was playing Burlington as part of the Burlington Tournament on Jan. 20. Afterwards, the team celebrated by huddling and congratulating their coach. Shortly after, the team signed the ball used in the game and gave it to Johnston as a gift. Johnston has been coaching for a total of 31 years, but has been a head coach for 24 years. Other than Rock Creek, Johnston coached at Blue Valley-Randolph, Mission Valley and Wabaunsee. “When I coached at Blue Valley, we had a 40-some losing streak, but the obstacle was figuring out ways of getting things done, becoming better as a practice coach [and] just putting in the time,” Johnston said. According to Johnston, the coaching style that he uses was inspired by one of his previous coaches. From his coaching and his style, many of his players say that he has had an impact on them. Like DeWeese, senior Martin Vogts said that Johnston takes the time to get to know them as players and as people. Likewise, Johnston said that he has developed bonds with his players, too. “I’ve had a lot of really good players and built a lot of good relationships with former players,” Johnston said.